Welcome to my Bio page. I am Captain Keith Powell. I am an Alabama Gulf Coast native son. I have been fishing Mobile Bay and the Alabama Gulf Coast my entire life. There is nothing more wonderful than sharing my expertise and knowledge and helping you catch fish. My approach to saltwater inshore fishing is the reason I stay as busy as I do. Everyone who fishes with me gets a first hand look at what a remarkable inshore charter should be like. I educate, instruct an demonstrate effective inshore fishing techniques so you may experience the thrill of inshore fishing. When I decided to go after my lifelong dream of being a full-time captain, I knew I had to be different than the competition. I have been fishing for speckled trout in the waters of Orange Beach and Gulf Shores, Alabama for years. I am a very competitive person and there is nothing more rewarding to me than to study these fish's habits and biting patterns in an effort to give you maximum opportunity for catching fish . I am up an on the water by 5 am most days. I am doing my homework in order to be prepared to serve you. BUT, it's not ALL about how many fish we can kill. With us, enjoying your time away from work with friends and family is at the forefront. Your family is safe with me. 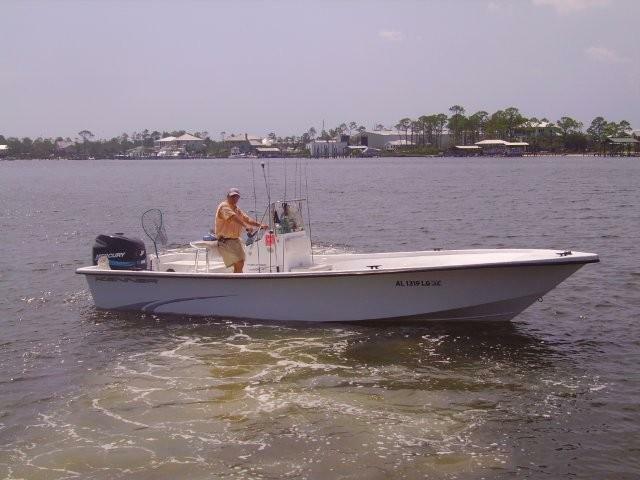 I am a professional and act that way throughout your entire inshore fishing charter. I do not use foul language or say anything that I would have to apologize for later. Your kids, wife and family are in good hands with me. I offer a very mild charter that is full of excitement, anticipation and a lot of action. I want you to enjoy yourself. I want you to come back. I want you to tell your friends about my inshore fishing charters. You are more than a guest when fishing with me. I treat you like family. You can relax and be yourself. Read our fishing testimonials to see what our past guests say about us. I spend most of my non-charter days scouting and looking for better places to catch my guests some fish. I believe that in order to be good at what you do, you need to invest your heart, your soul and your mind into it. I believe that you only get out of something what you put into it. As with any type of fishing, it comes with challenges and rewards. I work hard to ensure that the fishing looks easy. In reality, there are a lot of factors that affect a fishing trip. I want you to catch fish. I know there are sometimes when fishing is tough. I will tell you before we leave what I think the fish are doing and our chances are for catching some nice fish. Whether it is the tide, moon, water clarity, temperature, wind or season, I promise to give you honest answers about the fishing. There is more to being a guide than simply owning a boat. I take it a step further. Your Alabama inshore fishing charter is about trust. I promise to work hard to make sure you get the best back bay fishing charter that I can provide. If you have any questions about fishing, please visit our frequently asked questions page. Please fill out our reservations section or give me a call at 251.367.3464 and I will gladly assist you.